The physical mission of Breaking the Cycle South Pole is to make the first bicycle crossing of the Antarctic continent via the South Pole. 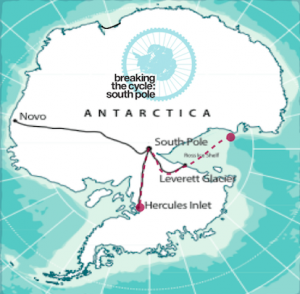 There are several route options, the shortest, simplest being an 1800km journey from Leverett Glacier, (Ross Ice Shelf), 650km to the South Pole and then 1150km down to Hercules Inlet (Ronne Ice Shelf). The preferred journey would start at McMurdo Sound and involve crossing the Ross Ice Shelf to Leverett Glacier, a total of 2800km. Antarctica is the coldest, highest, driest, windiest continent on Earth. Kate will face katabatic polar winds as I pedal toward the South Pole, (altitude: 3000metres) and generally benefit from a tail wind on the way back to the coast. Temperatures are expected to range between -15C and -40C in the extreme case. To turn this exciting challenge into reality I have been facilitating the development of some innovative technology such as the first all-wheel drive fat-bike, custom made clothing and the communications strategy. Breaking the Cycle: Education aims to help prepare our future leaders to make informed decisions to create a better world. Partners include: the Duke of Edinburgh’s International Award, JUMP! Foundation, Ivanhoe Grammar School, Belouga, Victorian Department of Education and Training, Exploring by the Seat of Your Pants, Scouts Victoria/Australia/WOSM and more. I have partnered with Y Generation Against Poverty (YGAP). YGAP is on a mission to significantly improve the lives of one million people living in poverty by 2018. It finds, accelerates, supports and grows early stage entrepreneurial ventures run by local leaders with solutions to poverty in their communities. Money raised by the Breaking the Cycle project will go towards ventures in Kenya and South Africa that support access to education. 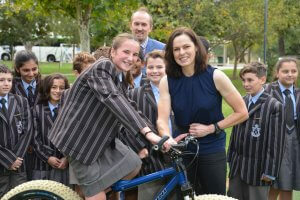 A role model inspiring girls and women to aim high and achieve their full potential. Breaking the Cycle is very much about taking action and inspiring others – leaders and changemakers, of this generation and the next – to explore to find their passion and to aim high to achieve their full potential. In particular, it is unacceptable that 130million girls and women still don’t have the circumstances to be the best they can be because they don’t have access to an education. To provide them with opportunities for a quality education will surely go a long way to ending extreme poverty and the world will be vastly better off from the brimming potential that will be unleashed. My multi-award winning support team has a phenomenal track record in expedition management and world-class media production. Collaborate with brands and broadcasters to produce the very best documentaries, viral films, social and digital media videos and images. Work with sponsors to design the most effective campaigns before, during and after the expedition. Here’s a short video of stills taken by Phil Coates on the team’s first training session in Spitsbergen, Norway. Together, if many people join my Breaking the Cycle Team, we will raise a tidy sum for The Global Fund and directly benefit HIV/AIDS initiatives in Africa. I am now focused on raising the sponsorship support to make BTC South Pole a reality. We’re seventy percent of the way there thanks to: Restons, Overland Journal, Dimension Data, Noel O’Brien, Simone Yeo, Australian Geographic, World Expeditions, Aldersley Capital, Christini Technologies, Mont Australia, Velocio, Ibis Cycles, VEE Tire Company, Hema Maps, Outdoor Food, Carver Bicycles, Cycle Works, OORR, Intuition Boot Liners, Outdoor Journal, Tatonka, The Heat Company, HED Cycling, ENVE, 45NRTH, Revelate Designs, Battle Oats, Hillebrand Tentmakers, Julbo Eyewear, Wilderness Wear, Ortleib, Snowgum, Ride Mechanic, Winning Spirit, HiQCell and Sportsmed Biologic and several private sponsors who are my major contributors to date.